The VORTI-SIV RBF-2 is one of the most efficient sieving and straining machines on the market. 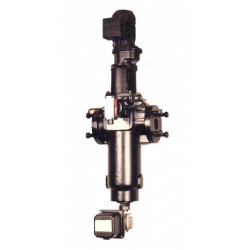 Blade-Type Self Cleaning Filters Vorti-Siv self-cleaning filters have been designed specifically to provide efficient filtration while minimizing both disruption to flow and liquid loss during the element cleaning process. The high quality stainless steel wedge-wire element is highly effective in removing contaminant particles as small as 25 microns. Cleaning is carried out by rotating the element against fixed scraper blades which remove debris from the surface of the element, this is in turn drained from the base of the filter. 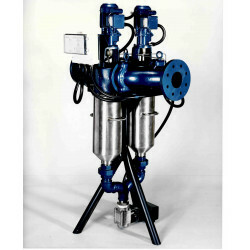 The filter is available for either manual or fully automatic operation. The range of optional control devices makes it particularly suitable for continuous processes and for service with high contamination levels. 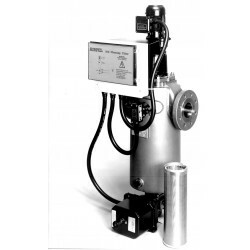 Size range 3/4″ (20mm) to 12″ (300mm) for flow rates up to 18000 liters/min. 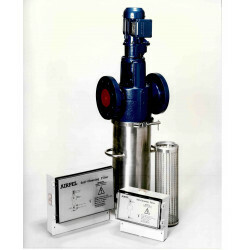 Standard elements provide filtration of 25, 50, 100, 200, 500 or 1000 microns. 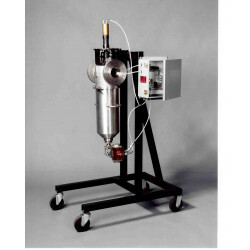 Suitable for all types of liquids including high viscosities. Integral heating jacket available on request.